As loyalty Apple fan, I guess you like to shoot photos with iPhone, well, probably with iPad or iPod touch, also. Thanks to its excellent camera performance, you may have stored lots of nice photos on your iOS device but experienced a problem on transferring your photos from your iPhone to your PC. Then this article will come as relief for offering a list of ways in which you can transfer photos from iPhone to PC easily. Read on to find the best one for you, and remember that all the ways work for the latest iPhone X and iPhone 8, also. You may also need to know how to transfer pictures from iPhone to Mac. 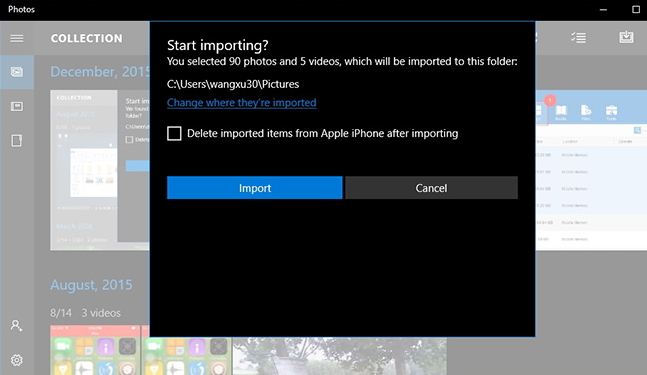 You can easily transfer photos to your PC by connecting your iPhone via Windows built-in function: Windows Photo Gallery. This is totally free of charge and without downloading other applications. Follow the steps. Step 1. Connect your iPhone to the PC with a USB cable. Step 2. Select the Start button, which is the Windows icon in the bottom left corner, and then Open the Photos app. Step 3. Select Import, and follow its instructions. It'll automatically select new items which haven't been imported before. Of course you can choose what to import, also. Note: This works for Windows 10. If you want to Import photos to Windows 8, refer to the Microsoft's instructions. If you use Windows 7, then import pictures to Windows 7 following here. Another way I use often is to email all the pictures to myself. Maybe you think that this is just too simple to take as a solution, but think about it - you can download all the pictures on all your computers, even other mobile devices. Step 1. Just select all the photos you want to transfer on your iPhone, and then tap on the Upload icon to choose Copy. Step 2. 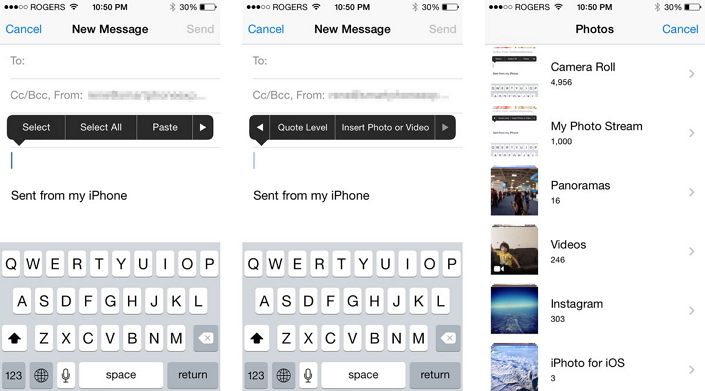 Open Mail app to edit an email and paste all the photos. Then send the email to yourself. Step 3. Now you can login your email on your PC and download all the photos. You can also double-tap the blank in the email body to insert the photos you want to transfer like the following picture shows. 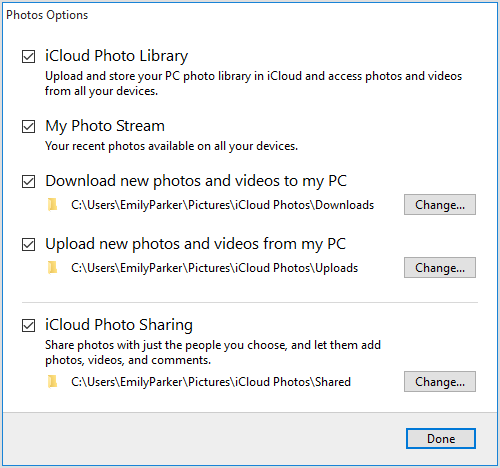 If you use iCloud Photo Library, then you can transfer the photos which have been uploaded to iCloud by downloading them from iCloud.com, or from the Windows. Follow the steps as below. Step 1. Log in your iCloud account on iCloud.com. Step 2. Click Photos to browse and select all the photos you want to transfer. Step 3. Click the Download icon on the top right corner and they will be downloaded on your PC. Step 1. Download iCloud for Windows from Apple's link and run it on your PC. Step 2. Log in your iCloud account and click Options next to Photos. Step 3. Check iCloud Photo Library and the other options will be checked automatically, also. Step 4. Click Done and then Apply. New photos on your iPhone you add to iCloud Photo Library will be automatically downloaded to the PC. 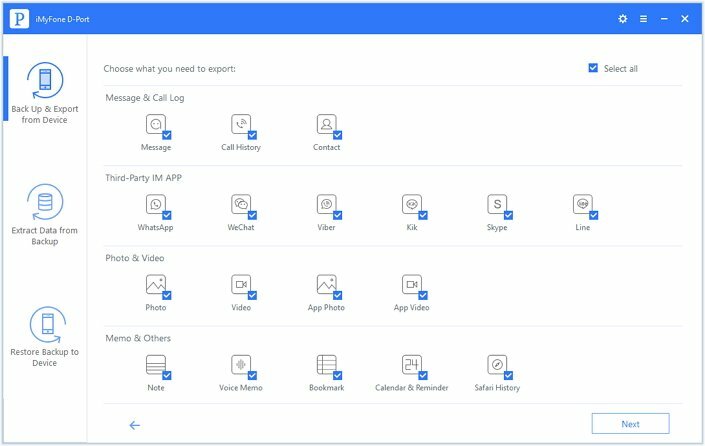 Even though so many good methods have been discussed above, we also have another tool to recommend, which will give you more freedom and options when you want to transfer data from iPhone to computer – iMyFone D-Port Data Exporter. What can this iPhone data exporter tool do for you besides transferring photos from iPhone to PC? Transfer photos without limitations, no matter how many photos do you have. You can do this without network or Wi-Fi. Won't affect the quality the exported photos. Supports transfer 18+ types of built-in and 3rd-party apps from iPhone to PC. You can transfer notes from iPhone to computer, export Safari bookmarks from iPhone to computer, and more. Supports to extract data from iTunes/iCloud backup also. Supports all iOS devices including iPhone 8, iPhone X running iOS 11 version. Step 1. download and launch the iPhone data exporter tool on your PC. From the main window, select the option "Backup & Export from Device" then click the "Export Data" button. Step 2. A new window will open prompting you to select the file type(s) that you want to transfer. In this case, choose "Photo". Once that is done the program will ask you to connect the iPhone. Step 3. Then iMyFone D-Port will detect the device automatically. Once detected, click the "Next" option to scan the iPhone. Step 4. After the scanning is done, all the images will be displayed in the interface. You can select all the photos that you want to transfer to you PC and press the "Export" button. Step 5. 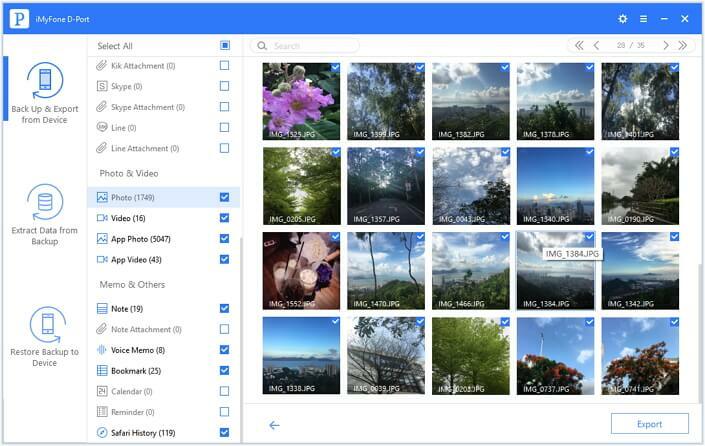 A new window will open up and ask you to select the location where you want save the photos. Find a folder on your PC. The program will then begin transferring the selected photos to your PC. You may get many ways to transfer photos from iPhone to PC. Most of them are easy enough to operate. 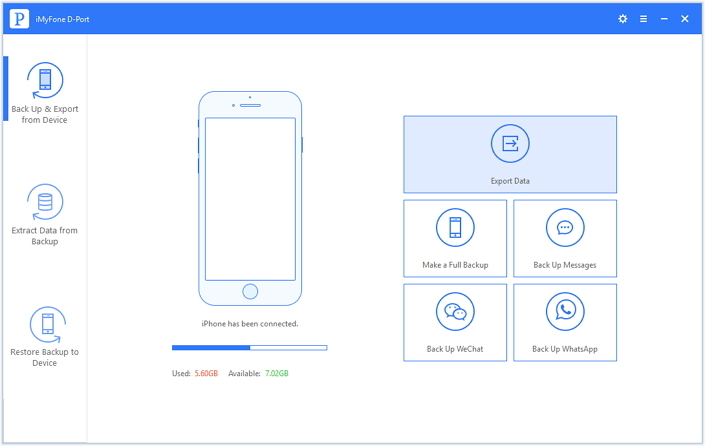 But if you want to transfer more types of data, then iMyFone D-Port, as a professional iPhone photo transfer software, will help you transfer kinds of data and files from iPhone/iPad/iPod touch to computer. Just download and have a try! How to Transfer iPhone to New iPhone (Selectively or Completely)?